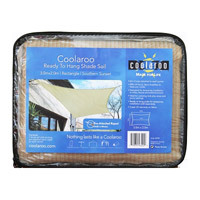 Portable Shade – Coolaroo Ready to Hang Shade Sails is a cost effective way of providing portable shade. 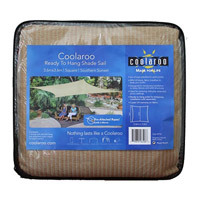 The Coolaroo range of ready to hang portable shades are perfect for camping, parties, sandboxes play rooms and picnics. Made with UV-treated material, this convenient portable shade serves as an effective defence against the harsh sun and is a wonderful replacement for gazebos and umbrellas. Above all, Portable shade sails are maintenance-free as the material resists the development of mould and mildew. Create a stylish outdoor haven with Ready to Hang Shade Sails. These portable shade sails are designed with a high quality HDPE knitted shade fabric and quality components to stand the test of time. The easy shade solution – No digging, cementing or waiting required. Get covered with our convenient and portable shade that blocks up to 90% of harmful UV rays. The portable light weight sun shade that’s easy to transport, store away and quick to set-up. Portable Shade sails are remarkably strong with amazing longevity to remain installed in hot/dry climates as well as cold and damp. Breathes by letting cooling breezes flow through Pre-attached ropes! Easy to clean – simply hose down 3 year warranty on fabric.